The Absco Premium Garden Shed is designed for maximum strength and manufactured from low maintenance ribbed steel sheeting. 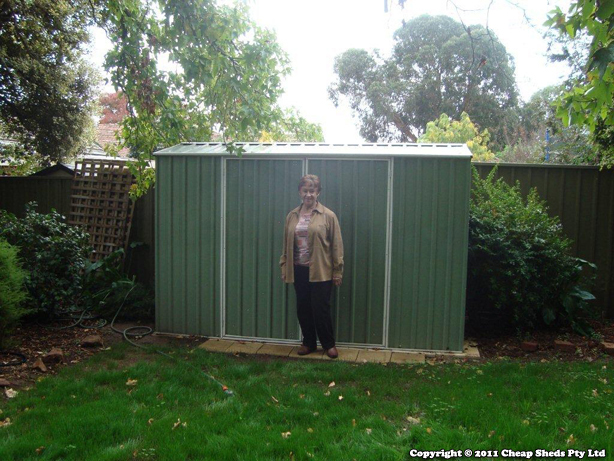 A very popular shed as it comfortably fits into most suburban backyards and has a very attractive price tag. For permanent secure installation of your shed it is recommended to use concrete anchors. To secure the shed to the concrete slab you will need 12 anchors for this size. I had to get a new television ariel put on my roof and the person that came to do this was very friendly and he told me he had not got much work so I asked him if he would like to put up my shed. I he said he would be happy to. I told him to go onto your site and watch the video on how to erect it which he did. He came the following week and levelled the ground and laid large paving blocks and then put the shed up. It took most of the day but we were both happy with the result especially as this was a first for him. I was then able to put all my garden tools and even a free standing set of shelves in the shed. My garden is now tidy thanks to my new shed.